Isaac COLBY (1640 – 1723) was Alex’s 9th Great Grandfather; one of 1,024 in this generation of the Shaw line. Isaac Colby was born 6 Jul 1640 in Salisbury, Essex, Mass. His parents were Anthony COLBY and Susanna [__?__]. He married Martha PARRATT in 1668 in Salisbury, Essex, Mass. 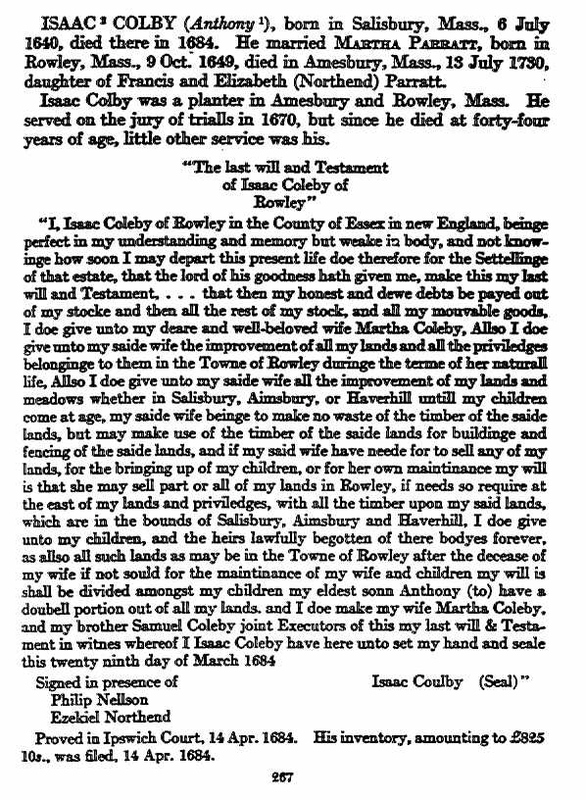 Issac died 13 Jul 1723 in Amesbury, Essex, Mass. Martha Parratt was born 9 Oct 1649 in Rowley, Essex, Mass. Her parents were Francis PARRATT and Elizabeth NORTHEND. Martha died 13 Jul 1730 in Rowley, Essex, Mass. 6. 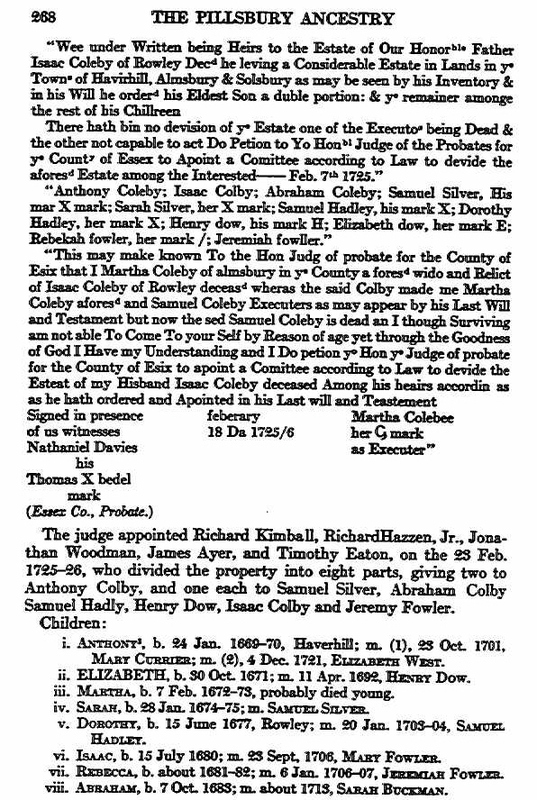 Dorothy COLBY 15 Jun 1677 in Amesbury, Essex, Mass Samuel HADLEY Jr.
Isaac was a planter in Amesbury and Rowley. Anthony’s first wife Mary Currier was born 28 Jan 1675 in Haverhill, Essex, Mass. Her parents were Samuel Currier and Mary Hardy. Mary died 8 Apr 1719 in Haverhill, Essex, Mass. Anthony’s second wife Elizabeth West was born 1673 in Haverhill, Essex, Mass. Elizabeth’s husband Henry Dow was born 5 Mar 1670 in Runham, Norfolk, England. Henry died in 1707. This entry was posted in 11th Generation, Line - Shaw and tagged Salisbury. Bookmark the permalink. Isaac Colby is my 9th great grandfather as well. The line runs from my maternal grandmother (Catherine Lee Davis. We stem from the maternal Silver line.